Example GISAXS data for a block-copolymer thin film. Grazing-Incidence Small-Angle X-ray Scattering (GISAXS) is a surface-sensitive scattering technique used to probe the nano-structure of thin films; essentially a reflection-mode version of SAXS. It is a versatile and powerful technique, which enables studies of nanoscale objects deposited on surfaces (e.g. nanoparticles), thin and ultra-thin layers of nanomaterials (e.g. block-copolymers), or nano-structured surfaces (e.g. lithographic patterns). 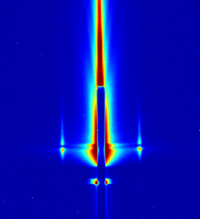 A typical GISAXS experiment involves directing a focused and collimated x-ray beam towards the surface of a thin film supported on a flat substrate. The grazing-incidence angle is carefully controlled using a sample-tilt stage, and is typically on the order of 0.05° to 0.50°. At these shallow angles, the x-ray beam is efficiently reflected off the sample or substrate surfaces. The scattering from the sample is then recorded with a two-dimensional (2D) x-ray detector. The beam interacts with the sample's structure, giving rise to scattering features (peaks, rings, diffuse scattering, etc.) that encode the nanoscale order in the sample. Careful analysis of the 2D scattering pattern enables quantification of many structural parameters of scientific interest. At sufficiently shallow incident angle, x-rays are totally reflected from a sample-vacuum interface. This can be understood in terms of the critical angle for the sample material; x-rays are totally externally reflected when incident below this angle. In such a case, the x-ray beam probes only a short depth into the film, due to the evanescence phenomenon familiar from visible light optics. For x-rays, this probing depth is on the order of a few nanometers. If the incident angle is well-above the critical angle, the beam is mostly transmitted through the sample-vacuum interface (though it may be absorbed by the substrate), and the reflected beam is extremely weak. Nevertheless, the scattering from the incident beam can be recorded. In this mode, the beam is passing through the entire depth of the thin film, and is thus probing the structure throughout the film. Thus, measurements above and below the critical angle can be used as a limited form of depth profiling: differentiating the structuring at the surface, from the structure in the 'bulk'. This can be quite valuable when comparing to other measurements. For instance, AFM or SEM typically only measure the film surface. GISAXS can thus provide insight into whether this surface-structure is representative of the buried parts of the material. In principle, careful variation of the incident angle near the critical angle enables reconstruction of the structure through the entire film depth (see waveguiding). In practice, this is challenging both from an experimental point of view (requires extremely smooth films, well-collimated x-ray beam, etc. ), and a data analysis point of view. Waveguiding: Especially when the incident angle is close to the critical-angle, the x-ray beam will tend to couple into waveguide modes, which will further enhance the effective scattering volume (a waveguiding beam bouncing repeatedly inside the film greatly increases the probability for a scattering event). Even when the incident angle does not match the critical-angle, some range of exiting scattering vectors will match the critical angle on the exit-side, which again means the experiment is probing waveguide modes. Multiple scattering: Scattering events can arise from either the direct beam or the reflected beam. Similarly, scattered rays can either reach the detector directly, or may be reflected from interfaces in the sample (especially the film-substrate interface) towards the detector. At shallow-angles, the reflectivity coefficients become large (tending to unity near the critical angle). I.e. the grazing-incidence geometry is efficient for directing the majority of the scattering towards the detector (as opposed to being lost within the substrate due to absorption). The grazing-incidence geometry of GISAXS leads to a variety of effects not observed in traditional transmission-mode (TSAXS) experiments. In particular, the refractive index of the film (and substrate) cause the incident and scattered beams to be refracted. Thus, the positions of scattering features on the detector are distorted. Also, scattering can arise from both the direct and reflected beams. Thus, a given intrinsic scattering peak will appear multiple times on the detector (c.f. DWBA). More broadly, multiple scattering makes GISAXS data harder to interpret. This page was last modified on 25 July 2015, at 12:54.